How to wear Pantone's color of the year. 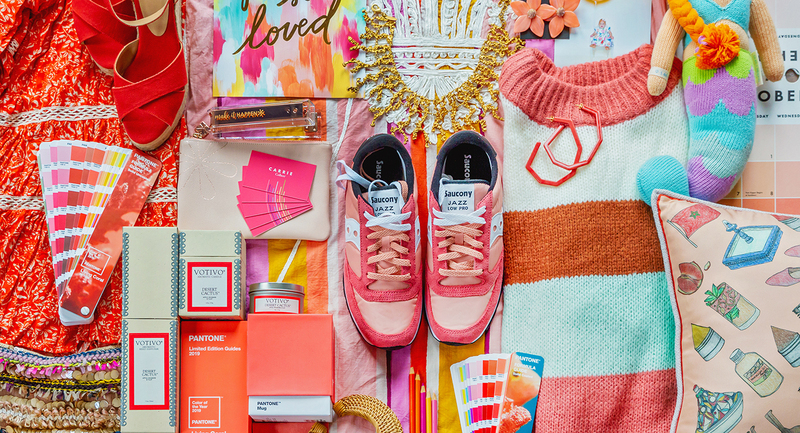 As you know by now, living coral has been named Pantone’s color of the year. We’ve talked about it in terms of interiors and with it being our color of the month, we of course have to talk about how to wear it. 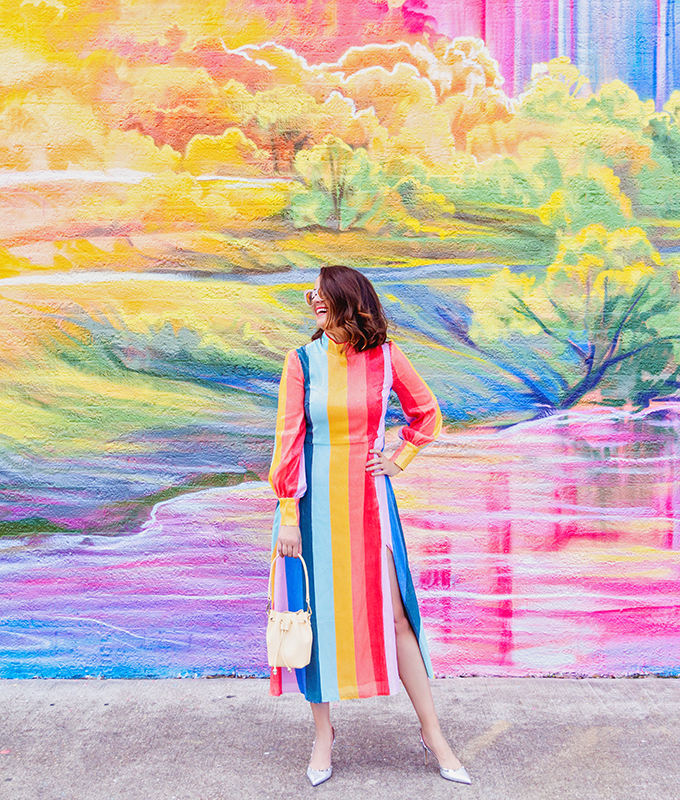 Other “how to wear color” articles include: blush, green, purple, burnt orange, cobalt blue, and more. This bold meets calming hue is absolutely beautiful in fashion. It goes with an array of colors, and it can be dressed up or down. It’s rather versatile, in fact. Before talking about ways to wear it, though, let’s get into the meaning of the color. 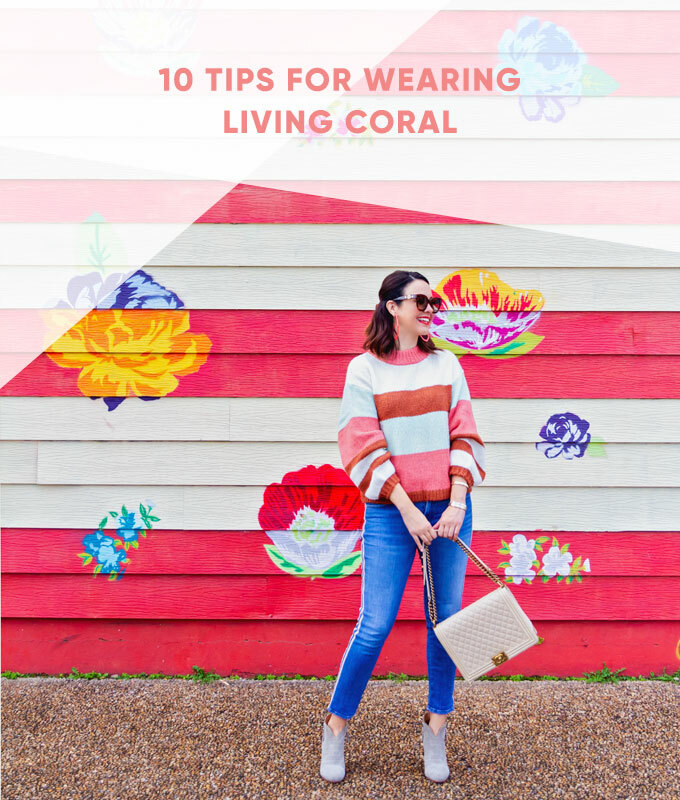 Coral gets its name from marine invertebrates at the bottom of the ocean, and often you’ll even see these invertebrates in home decor pieces and as patterns on clothing. The color itself is energetic and vibrant yet calming and inviting. It can give the feeling of warmth and lightheartedness in a chaotic world. It has a gold undertone and falls between pink and orange. 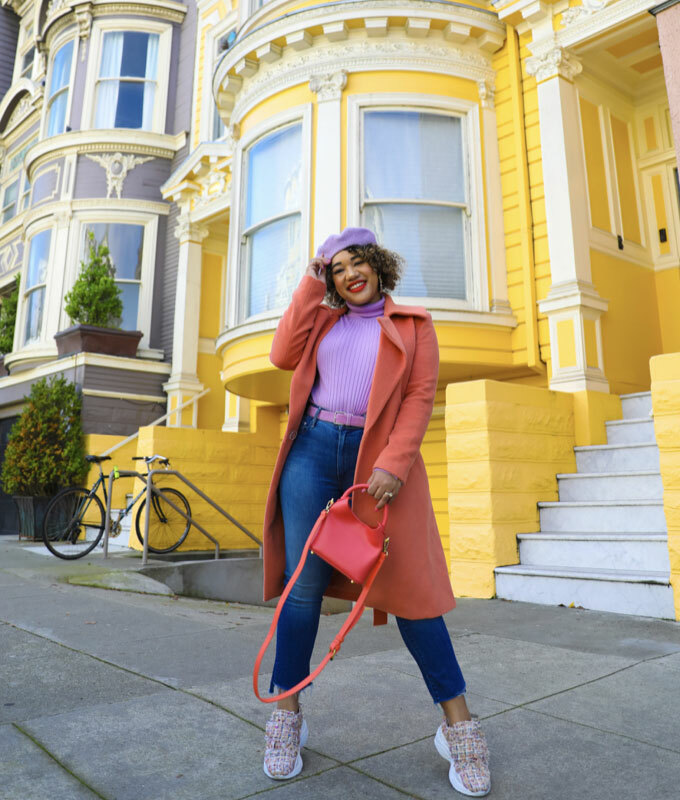 While we didn’t know if we loved it off the bat when Pantone announced it being the color of the year, we’re getting more on board with it each day. 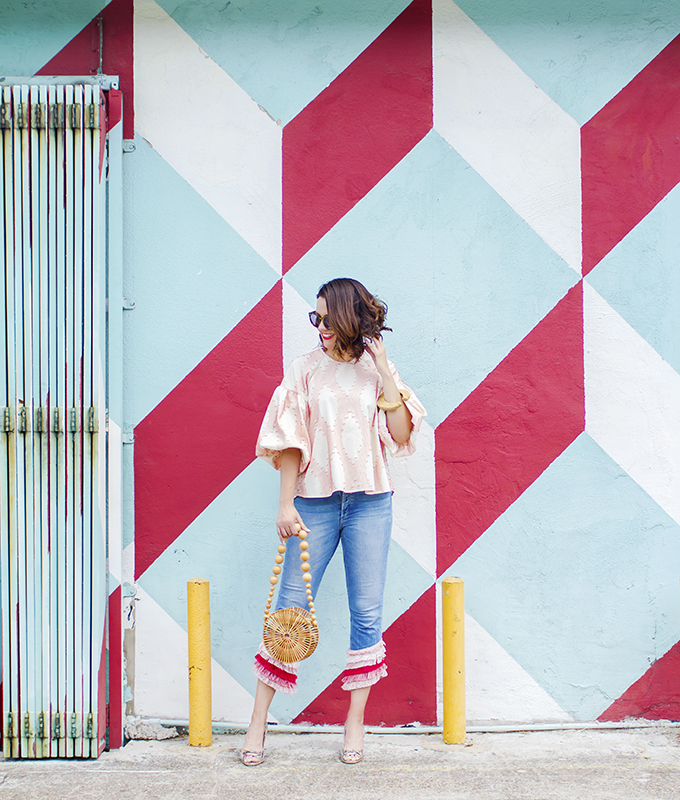 Below you’ll find tips on how to wear living coral, inspiration on how to wear it, and some of our favorite pieces you can shop right now. You know that we like anything in rainbow order. Sometimes rainbow order can be tweaked a bit from the traditional ROYGBIV and still be beautiful. Just look at this modified rainbow color palette Olivia Rubin created using coral as one of her colors. Sure, Pantone has defined “living coral” as a specific shade. But the color coral actually encompasses a beautiful spectrum of shades. 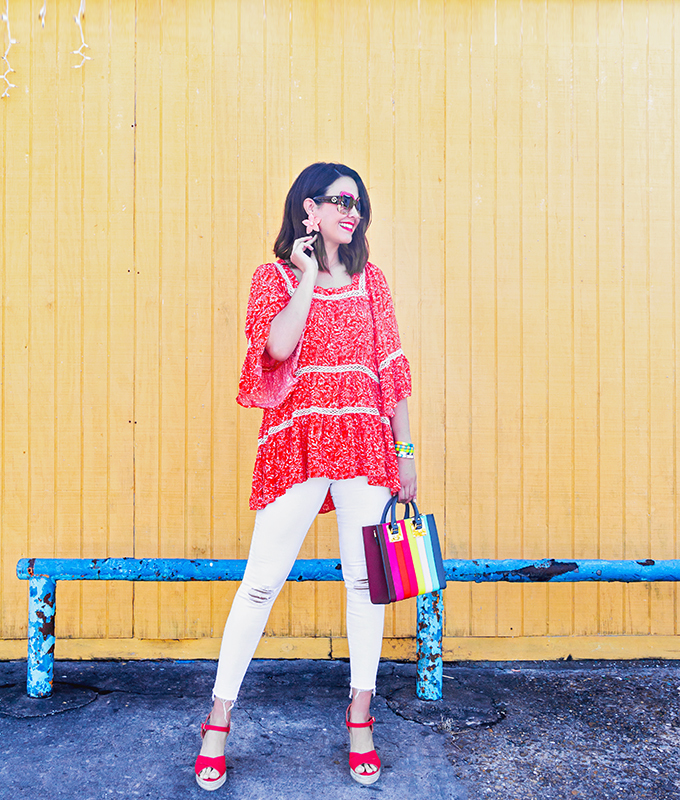 An easy way to wear living coral is within one piece. 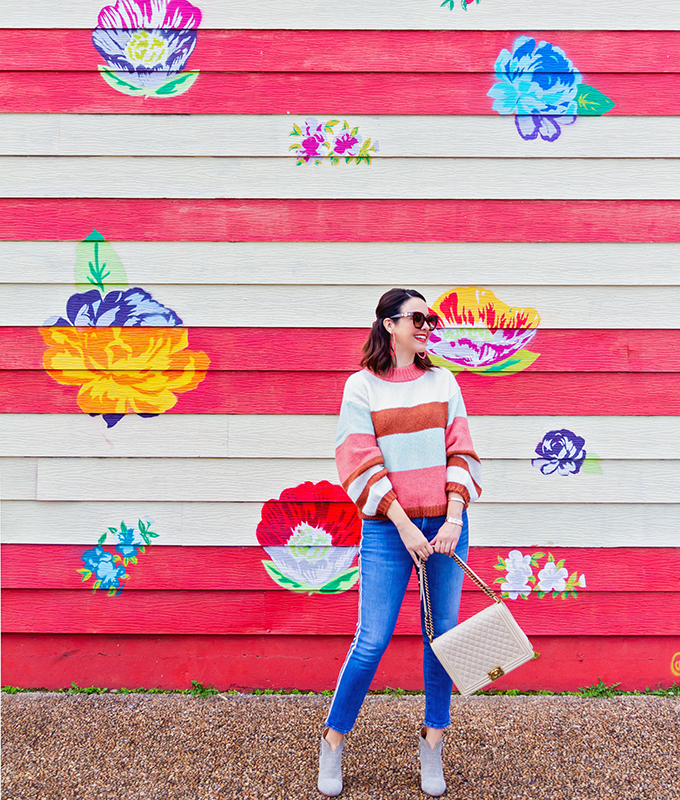 The sweater above, for example, combines multiple shades of coral along with other beautiful complementing colors. 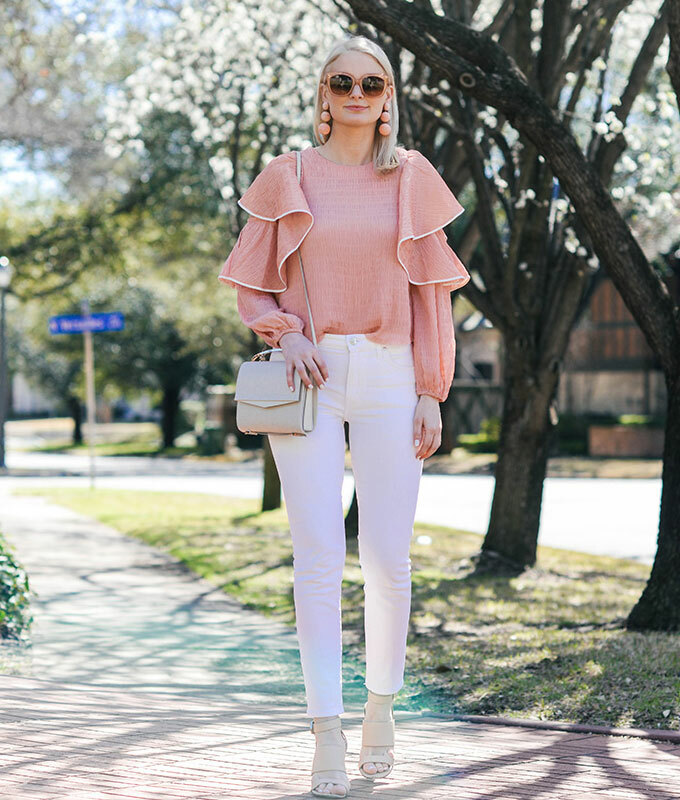 When you’re going somewhere warm, opt for a more saturated version of the color coral and pair it with crisp white, as seen above. 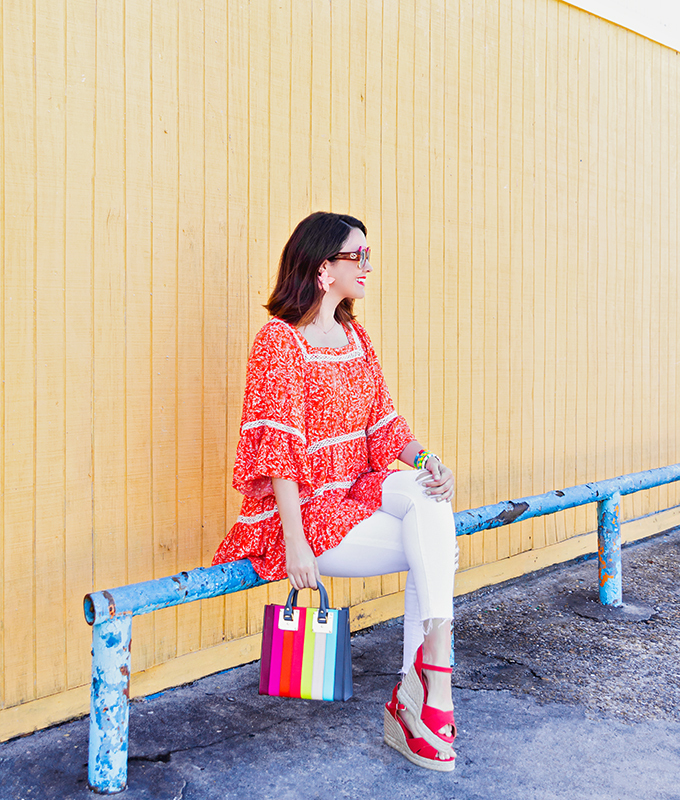 The coral color pops even more against the white backdrop! Remember color wheel color theory? That color theory holds that colors directly opposite from one another on the color wheel are pleasing together. That’s why orange and blue work well together. In fact, that’s my favorite complementary color pairing! Well, let’s move ourselves around the color wheel just a bit, and we’ll find that coral and turquoise have that same effect! This tip kind of ties in with the previous one… Because of that color wheel theory I mentioned above, really any shade of blue looks good with coral. The right blue just depends on what shade of coral you’re wearing. You can just play around, and see what works for you. Or, take a look at the color wheel, find navy, and then look directly opposite at what tone of coral you might try. Coral itself has pink undertones, so why not create a tone on tone look by using an array of pink, berry, and coral tones. Another easy way to wear this color is by way of a matching set. A coral suit is elegant, sophisticated, and fun. Coral and black work great together, particularly with a mellow shade of coral. The juxtaposition of that shade of color with the darkness of black creates a visually stunning look! Coral pairs with earthy tones in a gorgeous way. The colors complement each other extremely well, and it’s a year round look, indeed. Earthy tones can include hunter green, burnt orange, khaki, tan, and so on. The soft end of the coral spectrum would look beautiful with any of these. Gold is the best metal tone to accessorize with coral. Both evoke a warm feeling and convey a classy look. It’s elegant and timeless. Shop our favorite pieces here! 3. What are your thoughts on living coral? We’d love to hear in the comments below! 4. 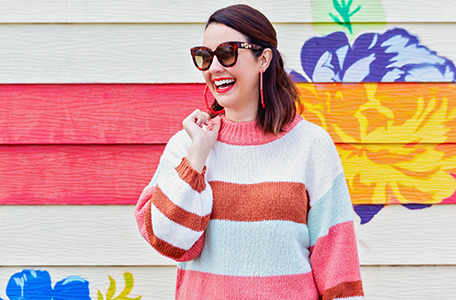 Don’t forget to check out our color of the month boutique with even more coral favorites. 5. Have a great day! 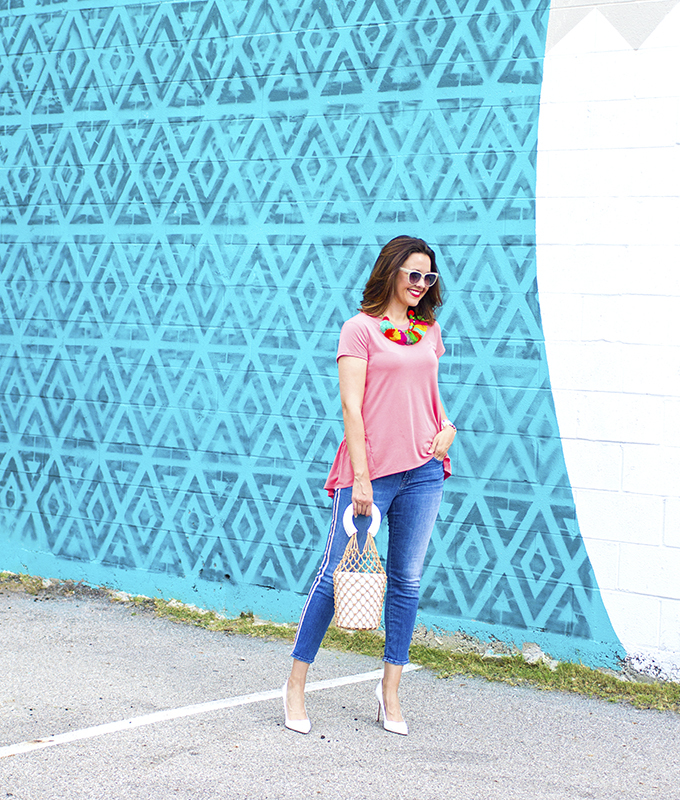 Love coral too, especially with turquoise! Such a gorgeous and vibrant combo! Just love that striped maxi dress on you! Yes, isn’t it a great color combo? I know it would look divine on you! PS – congrats on your exciting news! So happy for you. Unofficially kicking off summer this weekend! New moms know everything. Smart moms know better.